Many parents are excited to teach their children to read. When deciding what to teach first, I imagine that many parents start with what they know— sounding it out. /C/ /a/ t/. Caaaat. CAT. But did you know that kids need to know quite a few things about reading before we should teach them to sound out words? Learn concepts of print with nursery rhymes. 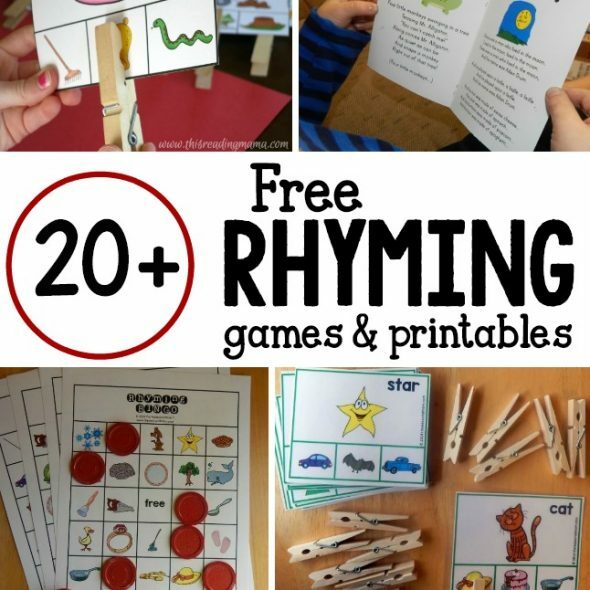 I created my nursery rhymes concepts of print pack so that my son could learn important pre-reading skills with ten fun rhymes. They recognize both upper and lower case letters. Obviously if you teach your child to sound out words with capital letters, he doesn’t need to know the lowercase alphabet. But since most books are written with both upper and lower case letters, it’s helpful if your child can recognize lowercase letters as well. One note on this point: If a child does not know every single letter and sound, he or she can still learn to read. Some letters, such as q and z, for example, do not appear frequently enough to be a huge hindrance to learn to read. We learn the rest of the alphabet by reading alphabet books and by playing a variety of games. We also like to explore the alphabet letter by letter in many hands-on ways. 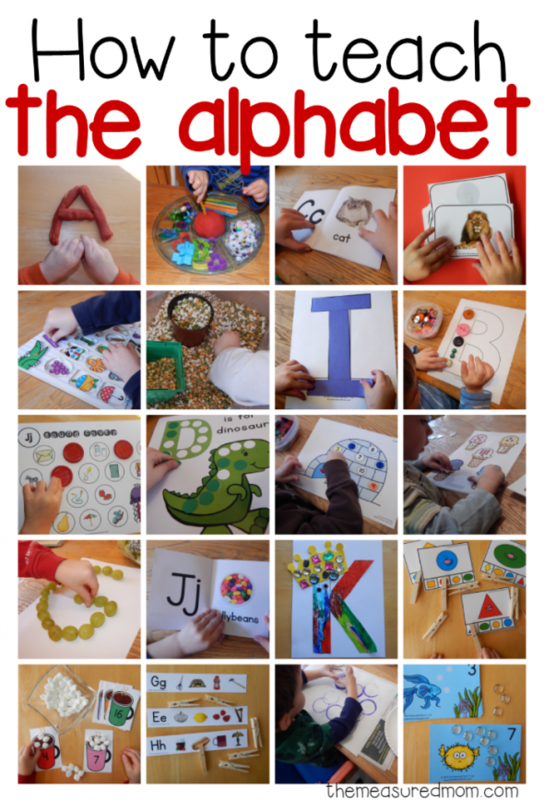 Check out my new ebook full of hands-on alphabet activities! Let your child choose books he loves when you read to him — but don’t feel tied to books you’re bored with. Pull out some winners from my book lists so that you’ll both enjoy yourselves! We use and recommend the LeVar Burton Kids Skybrary app. You can use it on mobile, tablet, and desktop. The interactive books and quality read alouds are a great way to get kids excited about books! Have you seen what people are saying about my letter of the week ebook? 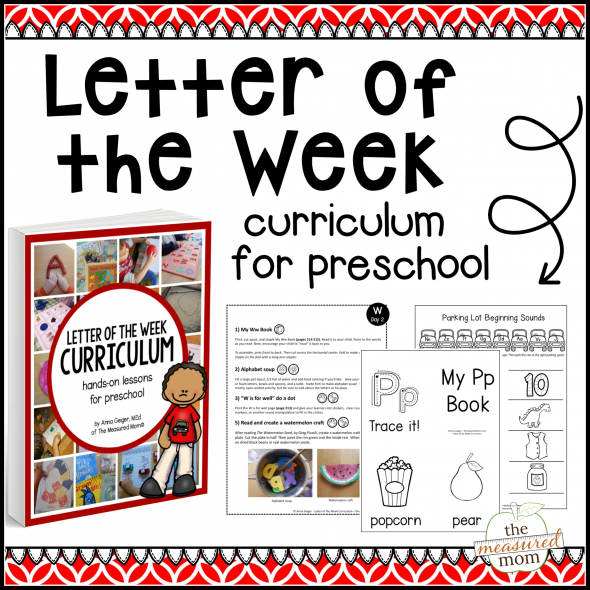 It’s a preschool curriculum both you and your child will love! Get it here. LOVE this!! For so many parents, “sound it out” is the only thing they know to how do and they don’t realize there are things to do beforehand. Great idea for a post!! Thank you, Ruth! By the way, your guest post got a LOT of shares on Facebook! Definitely a topic people are interested in! Yay!! Thanks so much for the opportunity, Anna! Can you share your post again? I’d love to read it too! Thanks! Wonderful reminders! Sometimes as parents we forget that there is so much more than just sounding out the words… I always love listening to the stories my little ones “read” out of books when they are pretending to read. Yes, those moments of pretending to read are so precious! Thanks so much for commenting. Great reminder that being able/ready to read requires many baby steps along the way!! And a new one to me was being able to count out actual words! Hadn’t heard of that– makes sense though! I always focused on sounds & syllables… Thanks! You’re welcome, Kristina – thanks so much for reading! What a great list of skills that are precursors to learning to sound out words. This is a great reminder for parents that kids need to be developing lots of intermediate skills along the way as they learn to read. My kids are just starting to “read” some of the books from the first BOB set. My son can sound out some of the words but my daughter is essentially reading using memorization and contextual clues (i.e., the pictures are reminding her what the words are saying). Upon seeing this, my husband said, “but she’s not really reading!” and I had to remind him that reading is NOT just sounding out words (although that is important). As mature readers we use contextual clues to help us figure out words all the time, just as our daughter was doing. Over time she’ll also add phonics to her reading toolkit as she makes her way toward being a mature reader. I like your final sentence … as a teacher I had some parents who couldn’t see any use for books that had words like “hippopotamus” for a beginning reader. They didn’t understand that kids can use context and picture cues too — otherwise there’s not a whole lot out there to read… at least not much that’s interesting! Such good advice and resources! I think sometimes it’s forgotten that “sound it out” is only one part of being a great reader. Thanks so much for including my rhyming activities, as well. 🙂 I’m going to share this resource with some of my preschool parents. Thanks so much for sharing, Mary Catherine! Thank you so much for writing this VERY educational blog post! I have pinned it to my “children” AND my “parenting” boards on Pinterest so that parents can understand how hard it actually is to learn to read. You’re very welcome, Bonnie — thank you for pinning! My son is 7, and I wouldn’t say he’s a struggling reader. He’s definitely going at his own pace. I learned how to read when I was 4 or 5, on my own. I memorized some books, and I can still clearly remember the letters forming words and it just clicking for me. I’m not expecting my kids to learn like me at all. I’m just flabbergasted on how I should go about teaching him. In kindergarten, he knew about 14 letters at the beginning. At the end he knew all the capital letters. The first have of 1st grade, I gave him more time and worked on lowercase letters and their sounds. In January, we started reading Teach Your Child to Read in 100 Easy Lessons. He’s catching on, and we also do a lot of other phonics worksheets. I love reading your blog because he does learn so much differently than me. I like that you show how kids learn, because I am lost in teaching my son to read otherwise. Thanks for following along, Molly! Feel free to write with specific questions. You can use the can use the contact form in the menu bar if necessary! What a great resource. Thank you so much for this. Pinning this and off to check out your rhyming resources, too. Thanks for visiting and for checking out some other posts, Holli! I hope they’re useful for you. So glad to hear this was helpful for you, Georgia! Great collection of information! Thanks for sharing at After School! An excellent list. HOWEVER, don’t you think it needs to begin with the concrete experience of cat, making sure a youngster knows what a cat is so that when the word is finally read it will have real meaning. Thank yo for this thoughtfully delineated piece. As an early childhood special educator and professional development provider, I intend to cite your considerate, well written piece — giving you credit and kudos. I noticed you are an early childhood special educator, so i am copying my general comment post to yours….and i hope you are checking for replies! Any hints for helping a child learn to read who is developmentally advanced, yet severely speech delayed due to speech apraxia? He loves books, and we read daily…but when he speaks, he is functionally unintelligible. He is 3.5 years, cognitively about a year ahead (due to his multiple medical issue, he has had extensive evaluations, so this isn’t just a mom saying so lol!) but cannot physically form words properly to speak properly. He has been doing speech therapy, but we are living outside the US and developmental services aren’t as readily available. As mom, i can generally get the idea of what he is trying to say, but few others can. So how do i help him learn letter sounds and pre reading skills if he cant repeat them? If you are doing therapy for speech apraxia you will be using pictures to represent the sounds your son is learning. You can use these pictures for learning to read too, instead of saying the sounds just point to the pictures of the sounds. 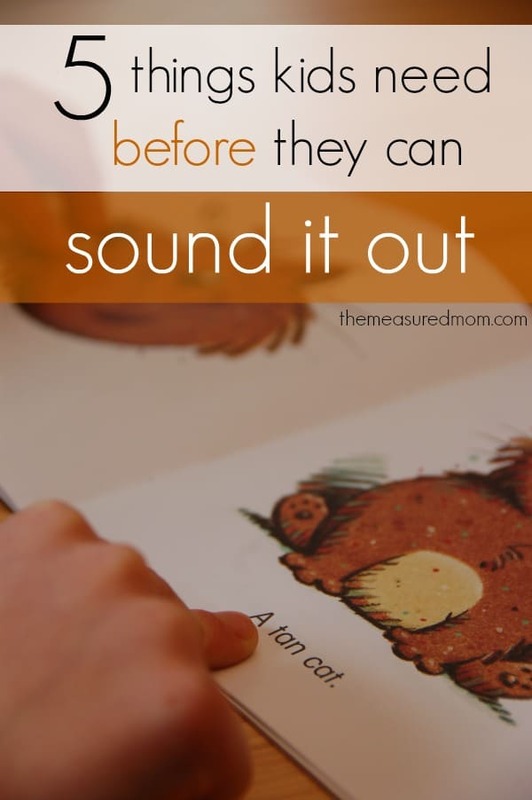 Your son’s heightened awareness of how to form the sounds and blend them together for speech will actually help him with learning to read if tasks are adapted appropriately for him. Certainly, Mary. If children are being read to and given lots of real world experiences, then the concrete experiences should be in place! THANKS SO MUCH FOR SUCH WONDERFUL IDEAS. Hello! Thanks for your question. I’m afraid I know very little about speech issues, but I can direct you to three great blogs by speech therapists. If you send a question to them via their contact forms or write a question on their Facebook page, one of them should be able to answer your question! Tell them The Measured Mom sent you. Hope you find what you’re looking for! Here are their blogs: http://www.two-daloo.com/, http://www.playingwithwords365.com/, and http://thelittlestories.com/. I would try the glen doman method. He taught brain injured and other delayed children to read using large cards with printed words on them introduced one at a time and making games out of identifying and fetching them and eventually joining them into stories and adding punctuation. No need to speak at all. The method works for very young normal children and struggling older ones too. The other thing is to keep a running commentary going all the time about sounding out letters. Oh look, there is a m – point to the m on the box or in the book – like m for mother and m for mug and m for moo etc etc. Hi, I know your post is over a year old and you may have found your solution, but just in case you are still hunting, there are some great apps out for the iPad to speak what is typed which could help your son ‘make’ the sounds associated with the letters he types in or reads from the story. In this way he would build on the concepts of letters/blend and sound associations. Also, there are apps that produce the sound that you match up with the letters. Some kids who can’t seem to get letter names straight, do well, if not better, with leaning letter sounds. I worked with an older middle school could who loved wrestling on tv. I got him to learn some sounds because he recognized by sight his favorite wrestler names. Thanks for the tip, Linda. I’ll give that suggestion to moms whose kids are having trouble with letter names. I think overall these tips are helpful. However, I disagree with stressing knowledge of the entire alphabet before beginning to read. In fact, I’ve never heard of this approach. I feel that learning letters sounds, acquiring phonological and phonemic awareness and sounding out simple words simultaneously works well and helps children stay motivated. I also prefer to teach letter sounds first, and letter names not at all. Children seem to acquire letter names without having to teach them. Focusing on letter sounds eliminates unnecessary information that can often make the sounding process more confusing. I don’t think children need to know all the letters and sounds before learning to read, but I don’t think they can sound out words without it. Some children can master sight words without a complete knowledge of the alphabet, but how can a child sound out a word without knowing the individual letter sounds? You mentioned that you prefer to teach letter sounds before letter names. In my experience it has not confused children, but I can understand the reasoning behind doing it that way. I do question your comment about having children acquire phonological and phonemic awareness at the same time as sounding out words. It goes against everything I’ve read, learned, and experienced. I’m curious if you’ve found some research to back up that approach. Totally agree Quincy! Teaching the alphabet is irrelevant. Teaching the sound each letter makes is the key. You can’t possibly decode an unknown word by saying letter names but by sounds, yes. Obviously not always the case due to the irregularities in the English language but saying letter names will get you nowhere! True, knowing letter names WITHOUT knowing sounds means children are not ready to learn to read (and in my post I do state that children need to know letter sounds). It’s also true that just because a child can recite the alphabet does not mean he understands it. But in my experience knowing both letter names and sounds has not been a problem. While I realize some children may get confused at having to know both, I have never observed this to be the case. I think that children can do more than we sometimes give them credit for. In the uk teachers generally teach the children to sound out alongside teaching letter sounds. So they teach the letter sounds and letters s a t p i and n first and teach children to create words and read words that contain these letters. Then they add to these as they go along the first few months of school – alongside teaching sight words like said etc. The theory is that children feel like successful readers from the get go and are practising applying the skills rather than learning the sounds in isolation. Very interesting, Beth – that sounds like a good approach if children are developmentally ready for it. Since many kids know their sounds long before they are ready to actually put them together to make words, I wanted to address that in this post. I know this is an older post but…I would dare say most kids know ALL their sounds before starting kinder because they use them daily. The goal is to associate the sounds with a letter. In this vein learning the alphabet NAMES is a waste of time. They do go on to learn the names as necessary on their own. I see so many worksheets, downloads, alphabet of the week games just to acquire the names of the alphabet and it is simply not necessary to read. It doesn’t matter that little Mary knows here alphabet names (and by that I mean can actually identify them by pointing to the letter) it gets her no closer to reading. I would recommend the booklet (and I do mean booklet–very short) A Path for the Exploration of Any Language Leading to Writing and Reading by Muriel Dwyer. I am a kindergarten teacher, and this post is SPOT ON! I will definitely be sharing it, because it sums up so many of the things WE teach, but parents can also work on at home! We’ve managed to break the binding on several books already and our daughter meets all of these criteria. She just turned 3 today and ever since she could hold a book, she has studied it page by page instead of just quickly turning the pages. She comes by it honestly as her daddy and I have always been big readers ourselves. The ladies at our credit union always get a kick out of seeing her come through the drive thru because she’s always holding a book and “reading” it. I am looking forward to focusing on teaching her to read this coming fall and will continue to keep these concepts in mind. Thank you. Hello, Lauree! Your daughter sounds a lot like my oldest who at just over a year always made sure she was looking at books right side up. I worked on early reading with her starting at about age 3. I didn’t have the time I would have liked since she had two baby brothers by this time, and it didn’t all come together until right when she turned 5. But once it clicked, there was no stopping her! I’ll look forward to hear how things progress with your daughter. Thx for this important infos/learning. I teach reading to very young children here in the Philippines. I could share these to the parents. Tthey too need to be educated. Great tip about phonemic awareness! Thanks so much for sharing that. I love this. It’s simple, yet gives you a ton of information that is easy to understand. I love the simple definitions and “how to’s”. I am sooooo using this next school year during my language and literacy parent meeting. AWESOME! Hi Tammy — you may have received a confusing reply to your comment on my blog. Sorry for that- it was meant for the previous commenter! I just wanted to thank you for your comments about the things kids need before they sound out words. Thanks so much for your interest in sharing the ideas with your students’ families; it’s definitely something that many parents misunderstand! I love this article. I am a reading interventionist and would love to share this with my parent group. Is there a way I can print this without all the pictures and advertisements? Thanks. Yes! At the very bottom of the post, you’ll see a tiny green “Print” button. Click on that, and you’ll have an option to remove images when you print. Great post that explains the steps to reading. You’re welcome, Kay – thanks so much for visiting! Thank you so much Anna for the ideas you have shared. I am a special educator in Fiji and love the activities that I have seen on your Pin Interest boards. Awesome stuff that I will definitely be using. Thank you so much for following along, Rosie, and for your kind comment! I hope you keep finding things here to use with your students. I love your website! You have obviously put a lot of time and effort into all of your work. I will share this post and others on my Facebook page for The Safety Educator. Thanks! Thanks so much for sharing, Maree! I wanted to share my homemade color coded phonics toolbox with you. It has done wonders for my child and her friend, both homeschooled. While kindergarten students, their phonic skills have soared with the use of this tool. I came up with this idea after watching an NPR special on math savants. Math Savants see numbers as patterns, colors and shapes. Thus, they are using more of their brain than only the math section due to the imagery. As I love the use of color in my manipulatives, it occurred to me to color code our phonics. The difference in my child’s confidence and ability shot through the roof. I no longer was bogging her mind down with phonics facts. The gray letters were clearly silent and sleeping. The brown letters say their name, particularly useful for the vowels. The green vowels are short. Those orange consonants or vowels, well, you must stop and think about it. Thus, words like the present tense read and the past tense read are clearly distinguishable. I cannot put to words why black text was an issue for my child. I can understand it. How do you know how to sound out a word that is just one long line of letters? Now, after the fact, I have come to learn that my style of teaching phonics is synthetic phonics. I especially love the long vowel approach, similar to “School Phonics” called Open Court. The original Open Court, not the one that is in print now. I am using Don Potter’s creation to school my child and my add on. They are doing amazingly well. For “spelling” and “handwriting practice”, I create a crossword puzzle. For letter retention and pattern recognition, I create a word search. Thanks for sharing that, Polly! This looks like a very interesting idea and something I can send people to when they’re looking for a different phonics solution. I’ve pinned your post. Thanks again! This is so helpful and in my training specifically with children with reading disorders this advice is absolutely spot on! I love all your tips and have really enjoyed checking out all of your posts. Just in reading through some of the comments, I got to thinking, in my experience with it has been necessary to teach letter names and sounds. When we think about our daily experiences, everything has a name..as does a letter. At around 18 months kiddos learn in awe that everything they encounter has a label, a name. A cat is called a cat, it doesn’t say “cat” it says meow, and it’s furry, and sometimes it purrs. Much is the same of a letter. This is letter is called “C” it says /k/, but sometimes it also says /s/ and when paired with other letters it can say other things like /ch/. There is value in teaching the label or name of a letter, because many of our letters say more than one thing. Reading and spelling really go hand in hand to complete the neural circuitry involved in the language processing of reading, in order to spell it’s really quite useful to know letter names, especially as phonics become more complex. It creates the building block or foundation of the process. Eventually only knowing DGE as /d/ /g/ /e/ will create problems in reading and spelling words like fudge. I read this list with interest, especially due to my being an early, avid reader. I was reading at a sixth grade level in first grade by school testing standards. While I agree with some of your points, such as needing to know the alphabet, other points confuse me as to why they would be required prior to teaching a child to sound out words, e.g. that a child must be able to count syllables in a word and that they must be able to identify the first and last sound in a word. I believe her organic way of teaching me and my siblings words, numbers, and then eventually to read was a wonderfully spontaneous way to encourage us. Had she waited until we met specific parameters prior to reading to us and working with us, I’m not sure that all three of us would have been the excellent readers that we are today. Thanks for sharing your story! We are of a similar generation, as I also enjoyed Sesame Street and the Electric Company. Like you, my mom read to us regularly (some of us sat up on the back of the couch so we could all see). My mom didn’t use a checklist before she taught me, either, and I was also reading quite early. This post is actually intended for parents who are anxious to teach their kids to sound out words but finding out that it isn’t working. I often have readers tell me, for example, that their 2 or 3 year old knows all his letters and sounds, but can’t sound out words. They want to know what’s wrong or what to do next. I direct them to this post – to help them see that their child may not be developmentally ready to sound out words. Doing the things suggested in this post can help them get there. “Sound it out” is not a prompt used in best practice classrooms due to the high number of words that are impossible for students to sound out which occur frequently in even the very earliest of reading books. Sound it out prompts the child to use one strategy which is visual, using the visual letters of a word to make an attempt, when we actually want children to focus on meaning. Another instance ‘the’; students need a base of known words before beginning to read as sounding words out takes away from meaning of the story. We would not want a child to sound out /t/ /h/ /e/ (e-like elephant) for “the”; nor do we want a child to begin with /w/ /a/ (like apple) /s/ for was. Reading is all about constructing meaning and there are so many phonograms that kids need to know in order to be efficient “on the fly” meaning driven readers. So rather than prompt a child with sound it out, prompt them to think about “what would make sense”. A helpful list to gauge reading readiness. For some kids there are a few more things that need to line up. My son had all these skills, but he just couldn’t get it. I was suspecting dyslexia, but took him to a developmental eye doctor first. Turns out he couldn’t sound out words because they were moving around the page. He has double vision and other issues. He is now in vision therapy and progressing. Yes, good point, Sakeenah! There may be other issues to look into. So glad your son is progressing! They also need to have a complete grasp of long and short vowel sounds– the ‘magic’ e, the r controlled and even some abstract vowel sounds. They also need to have a large bank of sight words– words that they can use as models for the unknown word. They also need to understand onset-rime. Chunking a word (looking for known parts) is FAR more effective and efficient in decoding unknown words than sounding out each letter. I don’t think kids need to know sight words in order to sound out words in isolation, but absolutely they need them in order to read books that make any sort of sense. Perhaps our definition of sight words is different. I usually think of them as words that can’t be sounded out (but they also include words that we see over and over again). I thought that I covered the concept of onset/rime in the section on phonemic and phonological awareness, but perhaps I could have been more clear. Although I appreciate that there are attention and cognitive functions that need to be present I disagree that kids need to know the alphabet or the names of the letters before they can sound out words. I taught both my kids to read very quickly with NO prior teaching of the alphabet. I used a book called Teach Your Child to Read in 100 Easy Lessons and the letter names and capitals aren’t introduced until about lesson 70 or 75. Both of my boys (including a very late June baby) started kindergarten reading well beyond their grade level and it was all using this simple book. In fact, I felt irritated when the teachers taught my kids that the letter a in an book said A like the letter name rather than uh like we pronounce it. It was like taking a step back to hear my kids it that way. I had to tell them that it was wrong to pronounce it like the letter name. That’s not how we speak or read as adults so why teach them the wrong way? I also disagree with comments that looking at pictures is reading. It’s not. Reading is reading. As a parent who volunteers every week in my kids kinder and 1st grade classes I have helped a lot in the class and teaching the kids to look at pictures does not help their reading and decoding abilities. It seems, to me, that teaching the sounds worked really well. And the real focus ought to be on comprehension from the start as that’s what matters in the long run anyway. Anyway, I’m not a teacher but in my limited experience it seems like we teach reading backwards sometimes and miss the whole point of why it’s important. Thanks for commenting, Rebecca! I taught my older two children to read without any scripted or synthetic program. Initially they used a lot of picture cues to help them read. Gradually we added phonics. Always, the focus was on meaning, which was why I felt it was important to have them use sight word readers in which they could not decode every word. They could figure out the words using picture cues, context clues, and grammar clues… in this way they were really focused on comprehension, not word calling. As they were developmentally ready, we focused more and more on phonics. They both went from very basic sounding out to exploding in their reading right around their fifth birthdays. Both were reading fluently upon entering kindergarten, and now (as a kindergartner and second grader), both read and understand at a 4th or 5th grade reading level. I am not entirely familiar with 100 Easy Lessons, but I always shy away from scripted or synthetic programs because I want to promote a joy and love of reading, and sometimes those programs hinder that. Obviously, though, the program was a success for your family, so I thank you for sharing your story! Some of my readers may want to look into it. Yes, exactly what Rebecca said!!! Do not teach the letter names until later. Teach lowercase sounds, only add in capitals as needed. And the word “a” is pronounced “uh”. I actually disagree with this. I don’t believe it’s necessary to teach sounds before letter names. I’m happy to discuss this further if anyone is interested in my reasons. Your comments are very good. But I do have to take exception to the line about reading from left to right. Many languages read from right to left and some even from bottom to top and from the back to the front. I think in a bilingual home, it is important to teach reading one language at a time. My Mother was bilingual in Lebanese. Her oldest brother never immigrated to America because he had chicken pox when the rest of the family came over. She had to write letters every week to him, and she found it very confusing to write English at school and Lebanese at home until she was in the third or fourth grade. I think that’s why she never taught any of us kids how to even speak Lebanese. Thank you for sharing a great perspective, Marilynn! Excellent advice! I originally read this for my 5 yr old in K but now I will apply this knowledge to my 9 yr old with autism. Very practical advice, thank you much for sharing! Thank you so much for all of your hard work !!! Your site is wonderful for me as a parent who just wants to enrich my child’s world before entering formal school. You’re very welcome, Renee – I’m so glad you’ve found things to help you help your child! Great! However, is there any better way? Weird. I never “taught” my four year old any of this, but I was reading through the list, I realized she already does all of these. I suppose because we are book worms? It will be a useful tool for my two year old, though. Effective literacy instruction would not include the prompt “sound it out” as there are far too many words that prompt would be highly ineffective for which in turn slows down the reading and processing of a child, equaling a loss in story meaning. “Sound it out” is all many parents know, which is why I addressed it here. I DO think it has a place, but not as a first choice. I think of it more as a last resort, as I prefer to offer prompts that focus on meaning. That said, children who are never asked to look closely at letters within words may resort to excessive guessing. So I’d never say that it should be completely excluded. Great list but I disagree with the rhyming. Most of my students that I teach are ELL and low income and have no experience with English or books. The rhyming is important in English but not Spanish and most of my students do not pick up rhyming until towards the end of Kindergarten after they have started to speak and understand more English, yet they can sound out and read many words and books before they grasp the concept of rhyming. Other than that, good list! Thanks for that perspective, Christina! I wonder if your students can rhyme in Spanish when they come to you. I think that the ability to hear words that rhyme is important, but perhaps it doesn’t matter what language children are able to do that in. But as you said, perhaps it isn’t a “must have” skill for every student. In my experience, it tends to be a warning sign when children (native English speakers) enter kindergarten and still can’t rhyme. Actually in Spanish, rhyming is not important. Most parents cannot rhyme and its difficult for our translators to explain rhyming to them. They come up with a few rhyming words to explain to the parents but in my area, rhyming is not taught nor important in Spanish. So I wonder if English is one of the few that it is taught in. Thank you! to public teachers who KNOW that EVERY student needs these things at his/her level because the teachers are the experts! Wow Im now motivated and more informed as to the approaches needed to prepare my child to read. As a preschool director with a background in Elementary education, I am fully aware of the necessary steps to learning to read. However, I have found it difficult to communicate these steps in an easy to understand manner to my staff. This article is perfect. Accurate and easy to digest even for those with little background in reading education. I plan to share this article with my staff. Thank you. Thank you so much, Heather! Your comment was a big day brightener to me – I needed that as I’m in the midst of sleep deprivation with our newborn! I’m so happy to hear that this article will be helpful to your staff. Although I do agree with you that reading is more than just sounding words out and needs a few foundations, first I would like to question you on the need for knowing the alphabet in learning how to read. Sounds of the letters yes, name of the letters? not so much, as the child will not be in a spelling-bee or classifying words in alphabetical order… I think you should make a differentiation between these two knowledge (sounds versus names of letters). Too often people think knowing the alphabet is such an important first skill, why is it so? Hi Christilla! I know some teaching methods advocate teaching children the letter sounds INSTEAD of their names – as in, referring to the letter A as /a/. Technically, yes, that can work, but I feel that since knowing the letter names is important down the line, there’s no reason not to teach it when children are toddlers and preschoolers… as this is a time they (usually) learn their letters easily in a playful way. If a child just really struggled to recognize the letters, then a parent or teacher might bypass that step and go straight to sounds – which, as you point out, are the main thing when learning to sound out words. Thanks for the great post! I’d love to share this with parents of my Pre-K students. I’m also wondering how I can print this without the embedded graphics. I don’t see the “tiny green ‘Print button” at the bottom of the post. Thank you for this!! My 3, almost 4 year old, is so ready to read like his big brother but this was an awesome checklist to read through so I don’t frustrate him! Love the counters in a cup for every word idea… I will do that for sure!! Yay – so glad this was helpful for you, Katrina! Thank you so much for your encouragement, Cindy! It means so much! Thank you so much for that kind encouragement, Lisa! I love this very informative article about early literacy skill! It was quite some time ago that most of us parents learned to read and instruction has come a long, long way! How exciting! These are great points, Melissa. I use that phrase because it’s what most parents are familiar with – indeed, to many, “sound it out” is equivalent to reading. But in my posts in which I share printable books, games, etc. I do talk about the many different approaches to word solving. The phonemic awareness has to come before the alphabet recognition. Sounds are more important than learning the letters. That comes next.